Special graphics include a vivid yellow-green accent that contrasts with the bike’s otherwise dark colouring. Special tank pads with R Edition graphics are standard equipment. Special frame pads with graphics add to the design. To bring the already formidable braking performance of the Z1000 to the next level, high-spec brake components like those found on the Ninja H2R were implemented. The Brembo components featured are the best available for a massproduction model. The highprecision operation delivers brake force linearly, contributing to superb controllability. 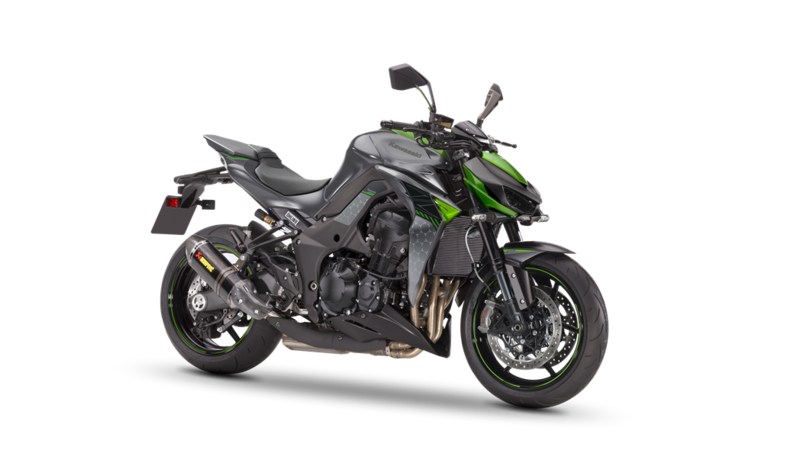 The Z1000 gets and even sportier attitude thanks to this Akrapovic slip-on system. The stunning looking and lightweight slip-on system offers great sound plus enhanced performance. Craftsman made from the best available materials, this system is an understandably popular upgrade choice.